The Bell Mountain Buckaroos descend Ridge of Bell into Copper Bowl Sunday during Aspen Mountain's last day of the season. The ski area just announced they will also open for Memorial Day weekend. 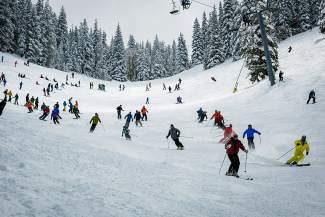 ASPEN, Colo. — Colorado’s Aspen Mountain will open for skiing and snowboarding on Memorial Day weekend. Aspen Mountain previously opened for Memorial Day skiing in 2008, 2010, 2013 and 2014. Aspen Skiing Co. announced Monday that it would extend this year’s season until May 30. Skiing will be available off the Ajax Express chair on the upper part of the mountain. The National Weather Service forecast calls for a slight chance of showers and thunderstorms Saturday, with a partly sunny Sunday and Monday and highs near 68 degrees. DENVER — The National Weather Service says thunderstorms developing over northeastern Colorado have the potential to create intense tornadoes. The storms have been producing hail in the Denver area Tuesday afternoon and are expected to become more powerful as they spread eastward. A tornado watch was in effect for northeastern Colorado through 8 p.m. The watch area included Denver and its airport but no problems had been reported as of 5:30 p.m. Tuesday. BOULDER, Colo. — Authorities in Boulder County are investigating after police shot and killed a man who had reportedly been shooting into Boulder Creek on Sunday. Police say the man pointed his gun at two officers who went to investigate, leading them to both fire at the man. The suspect was taken to the hospital where he died. The coroner’s office identified him Monday as 28-year-old Bryson Fischer, of Erie. Police are also looking for a second man who appeared to be with Fischer and ran away from the downtown area popular with joggers, cyclists and strollers. Another shot was heard in the same area about 20 minutes later, but it’s not clear whether that was related to the original shooting. Law enforcement agencies from around the county are investigating. DURANGO, Colo. — Four men from Arizona are being held in the shooting death of a Colorado college student during a home invasion. Twenty-year-old Samuel Gordon, a junior at Fort Lewis College in Durango, was shot in the head after police say the suspects allegedly pushed their way inside his off-campus home around 3:45 a.m. Tuesday. There were four other men in the home at the time who weren’t injured. The Durango Herald reports police stopped the suspects’ vehicle as it was leaving the area. Lt. Ray Shupe says one of them is a former Fort Lewis student and an acquaintance of Gordon’s. He says it appears that they were all at the same party earlier in the evening. Gordon was from nearby Cortez and was majoring in biology. COLORADO SPRINGS, Colo. — The El Paso County sheriff says a racial slur directed at President Barack Obama prompted the retirement of a veteran department official. Lt. Robert Jaworski retired May 5 before a disciplinary board was convened to consider taking action against him. Sheriff Bill Elder told The Gazette that he would have fired the longtime investigator if he hadn’t stepped down voluntarily. Elder says Jaworksi acknowledged making the comment spontaneously when the president appeared on television in a break room. Jaworski left with his retirement benefits. Elder says he would have received them even if he had been terminated. No phone listings for Jaworski were found so he could not be reached for comment. The sheriff’s office has denied a request from the newspaper for a copy of the report of the internal affairs investigation. Ryan Frazier says he’s confident he’ll secure his spot on the Colorado Republican Party’s U.S. Senate primary. The Aurora businessman welcomed a Tuesday ruling by the state Supreme Court that decreased the number of voter signatures he still needs to qualify for the June 28 primary. The court also ordered a district judge to decide by Friday if another 51 signatures should be accepted. If they are, he’ll qualify. Frazier challenged a finding by Secretary of State Wayne Williams that he didn’t collect enough signatures in the 3rd Congressional District to qualify. Frazier’s name is on the ballot pending the appeal. Frazier was campaigning in southern Colorado Tuesday. He said the dispute hasn’t slowed his fight to emerge from the primary as the GOP challenger to Democratic Sen. Michael Bennet. IDAHO SPRINGS, Colo. — Road crews working on Mount Evans won’t get the holiday weekend off. The highway to the summit usually opens on the Friday before Memorial Day but the Colorado Department of Transportation says this year the road will only open to Summit Lake on Friday because of all the snow that fell in May. Crews will keep working through the weekend to clear the four miles above the lake and expect to have it ready to open all the way to top Monday. Independence Pass is on track to open Thursday, its traditional opening day. Trail Ridge Road through Rocky Mountain National Park, Guanella Pass and Cottonwood Pass are all scheduled to open on Friday. Kebler Pass will remain closed for now because of road damage.